Tropical Oasis W/ Wi Fi !! Enjoy Hawaiian living in this spacious 2 bedroom, 2 bathroom, 2nd floor condo with an ocean view. Large lanai with bamboo Tiki Bar overlooks the eighth fairway of the Kona Country Club. This unit sleeps up to 6 persons comfortably and allows you the tranquility of the Island. This unit is updated with fully stoked kitchen, all appliances and beautiful bamboo flooring. Beach towels, bamboo mats and cooler are available for guests to take to the beach. Minutes from Kona nightlife, great shopping, excellent restaurants, cinema, grocery store, post office, Farmers Markets and pharmacy. 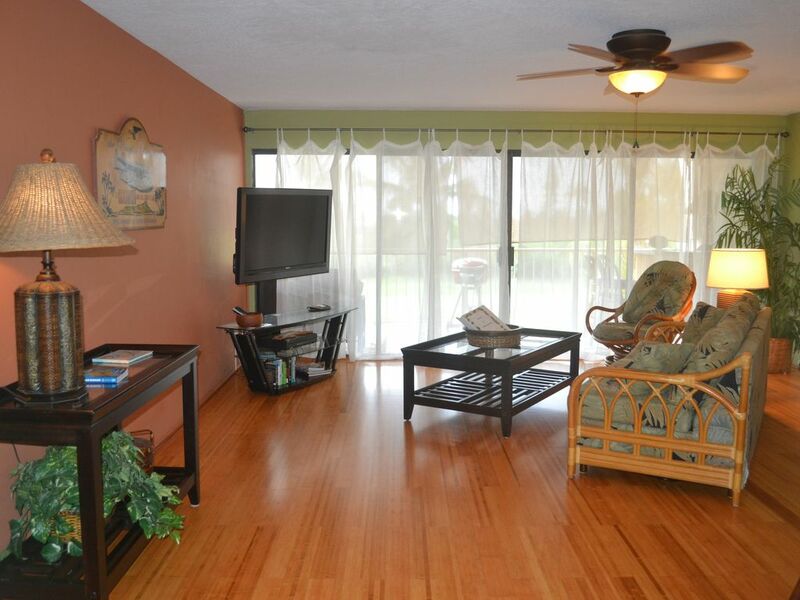 This condo is located at the south end of Alii Drive in a quiet cul-de-sac where you have a designated parking space that is wheelchair accessible. Whether you are a sports enthusiast or someone who wants to relax and watch beautiful sunsets, this is the condo for you. Tropical Oasis is truly an oasis! From the moment you open the front doors and see the beautiful view to the golf course and ocean. The property is nicely decorated, and well appointed with everything you need - coffee pot for the delicious Kona coffee, blender, lots of dishes, cookware, towels, and beach things. There is also an inventory of cooking items - spices, olive oil, aluminum foil, etc. The community areas are beautiful with a large pool and spa, and lots of tropical plants. Laura, the property manage is a dream to work with. We have stayed at Tropical Oasis three times and will be returning next year - what more can I say! It is always a great place to stay on the west side of the island. It is in a quiet area. The condo is comfortable with everything that you need. The view is beautiful. The condo is beautiful and comfortable! We had such a wonderful time. It was very clean and tidy and had all the amenities like home. Perfect place with all amenities and comfort. Just wish unit had air condition. Beside that perfect all around place. I wish I had taken my golf clubs and a fishing pole. Then I would have been really tired and more thoroughly enjoyed the very comfortable master bed. This condo is conveniently close to the Keauhou shopping center, and borders the Kona Country Club. You don't hear the traffic on the Ali'i "motor speedway" which fronts the development, and provides great access for a southbound trip. Best of all, there are no stairs to contend with as you haul luggage, groceries or yourself to and from the parking lot. Look at the geckos on the walkway, and as you take the 38 second stroll to the very clean swimming pool. We had a wonderful time. The condo was beautiful and everything we could have wanted was supplied. We especially enjoyed our evenings on the lanai.